DR DAVID Owen, once a Labour Foreign Secretary who led a right-wing split in the party in the early 1980s to form the short-lived Social Democrat Party, was once a staunch supporter of Britain being part of the Common Market. But last week he called on people to vote to leave the European Union in order to rescue the NHS. Owen was speaking in response to a claim by discredited Health Secretary Jeremy Hunt that leaving the European Union would endanger the NHS. But Lord Owen said: “The EU/Eurozone from 1992, in marked contrast to the old European Community of 1975, creeps into every nook and cranny of our life. MORE than 150,000 people marched from Gower Street near Euston to Trafalgar Square last Saturday, in a giant march organised by the People’s Assembly as a March for Health, Homes, Jobs and Education but, in the wake of the Panama Papers tax dodging scandal, added one further demand — that David Cameron must go. Before the march the organisers issued a statement: “The Tories are facing their biggest crisis yet. Revelations of David Cameron’s stake in his father’s off shore tax haven prove that this is a government for the privileged few, not for the majority. “This shows beyond all doubt that Cameron is divorced from the life of any working person. The Government’s failure to deal with the steel crisis could leave thousands without a job. 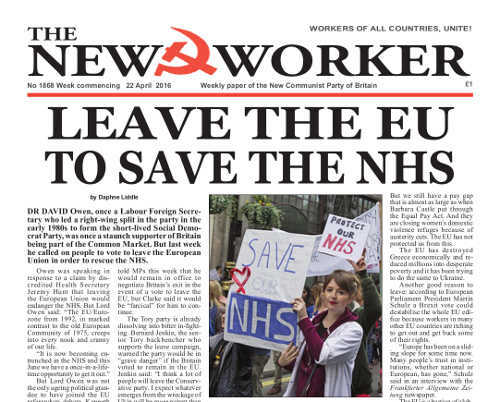 They’ve attacked junior doctors and student nurses while privatising the NHS.